I know I've neglected my Catalan Calligraphy, it's been more than 2 months since I posted a letter, I have to apology for it. I didn't feel quite well at the end of May and then with doctors appointments, tests, books and family... I didn't have much free time to search for original words to share with you and to make some nice calligraphy to create! 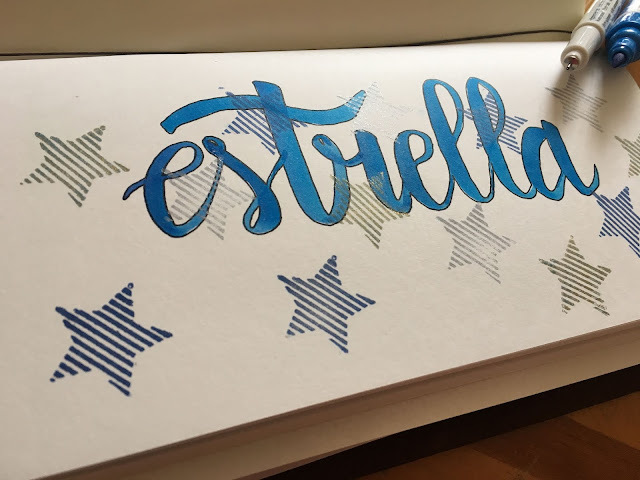 So today I want to show you the word "Estrella", is a word I really like, not because is something untouchable but because I like how the word sounds in my mouth! I don't know if you know or guess what it really means, it has some similarity with the english word... "Estrella"... is the same as Star! Here is a beautiful song that my mum used to sang to me when I was little! I searched for it and it seems is a typical German song! No has comptat mai les estrelles, quan la nit estén el vel? Have you ever counted the stars, when the night springs the veil? Elles fan les nits més belles quan llueixen en el cel. They make the nights more prettier when they bright in the sky. Déu els va donar la vida i l'esclat. God gaves them the light and the end. Déu és qui fixà el curs del seu pas. God gaves them their path. Sap el nom de totes elles i no les oblida pas. Knows the name of all of them and will never forget it.